Market capitalization - what is it? How to calculate the market capitalization? 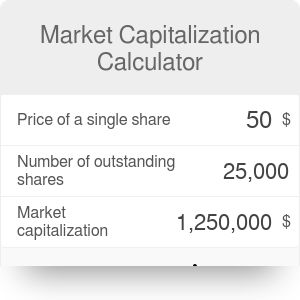 Market capitalization calculator is a tool that helps you calculate market capitalization (market cap in short) - the total value of a company's outstanding shares. If you don't know what it is, don't worry - we will explain it in this short article. You will learn what is market capitalization and how to calculate it, as well as discover the market capitalization formula. Interested? Keep reading! Market capitalization, also used in the enterprise value method of company valuation, is the total value of outstanding shares of a given company. This parameter can be used to determine the size of a company. Potential investors want to know it because, while it's reasonably easy to calculate, it provides a lot of information about other characteristics of the enterprise such as the level of risk. Using market capitalization also lets investors diversify their assets by including large-cap, mid-cap, and small-cap companies in their portfolio. This division is based on the value of the market cap. Large-cap companies have a market cap of around $10 billion and more. Usually, this term refers to companies which have been operating for a long time. They are popular, stable and well-established on the market, so investing in them is considered safe - even if short-term returns aren't spectacular, investors can expect continuing growth of share value. Mid-cap companies are these with a market cap between $2 and $10 billion. They are not so well-established as large-cap companies, so there's more risk connected with investing in them; however, they are supposed to grow rapidly in the nearest future. The last group, small-cap companies, includes ones with a market cap lower than $2 billion. Usually, they are young or operate in niche markets. The risk here is the highest among these three groups, but they might give investors the highest return on investment. Number of outstanding shares of a company (the ones currently owned by the shareholders). Let's analyze an example of a company that has been on the market for a few years now. We're aiming to determine whether it's a large-cap, medium-cap, or a small-cap company. Find out how many outstanding shares the company has. Let's assume it's 10 million shares. Determine the current price of one share. We can say the company sells them at a price of 100$ per share. The market capitalization is equal to $1 billion. We can conclude that this company is still a small-cap one but probably has some potential to become a medium-cap business in the foreseeable future. Market Capitalization Calculator can be embedded on your website to enrich the content you wrote and make it easier for your visitors to understand your message.